Firecracker, firecracker, boom boom boom! 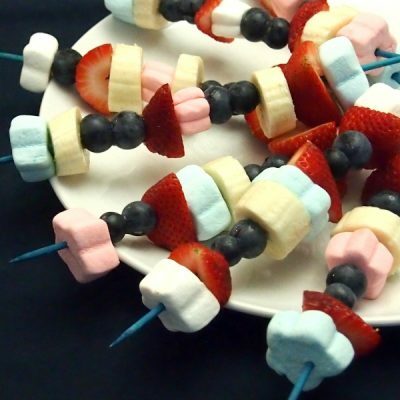 Yes, these 4th of July fruit kabobs will make your kids explode with excitement as their favorite food is served on a stick! My boys were cheering with excitement when they saw their dessert! The StarMallows marshmallows are the funnest (yes, that’s a word) part of the kabob. Red, white, and blue stars of varying sizes layered in between the patriotic colored fruit makes this kabob burst with color and explode with sweet yumminess! Red, white & blue fruit and fluff on a stick! Bamboo skewers Try checking in the seasonal summer section of your superstore or grocer for colored kabobs. This is where I found our fun blue ones! Lightly wet the bamboo skewer before using. This helps the first marshmallow slide on rather than leave a sticky residue. Layer the fruit and StarMallows leaving about 1" at each end of the stick. To serve, stack 'em up or fan 'em out like a firework. 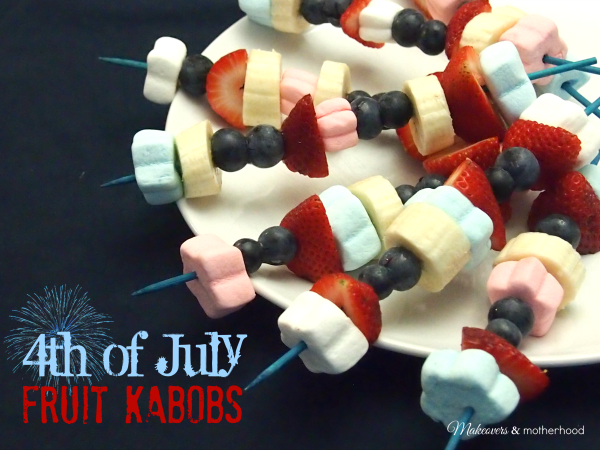 These 4th of July fruit kabobs are a festive food for your family’s celebration! This would even be a great fine motor activity and way to get you kids active in the kitchen! Happy 4th and happy eating!